Small and spiffy. Voice control with supported smart home UIs. IFTTT scripting for extending smart capabilities. Impressive print quality. Competitive ink costs with Instant Ink, plus free snapshot printing from your smartphone. Borderless prints limited to 5-by-7-inch. Single, small paper input. “Scans” and “copies” only via smartphone. HP’s Tango X “smart printer,” the first we’ve tested with voice activation and smart home features, is all about printing from mobile devices. It’s not perfect, but given its unique free-snapshot printing angle, it will be a tough act for future models to follow. Plenty of us shout things at our printers. But what if yours heard you? Of midpriced all-in-one (AIO) printers, none is more cutting-edge—and attentive—than the HP Tango X ($199) and its less expensive sibling, the HP Tango ($149), among the first printers to support voice control. They are designed to work primarily with mobile devices—desktop PCs and laptops are an afterthought—and they have the unique distinction of letting you print snapshots from your smartphone for free, in a sense (more on that later). We tested the Tango X, which delivers print speeds, output, and running costs comparable to similarly priced competitors without all the smarts. 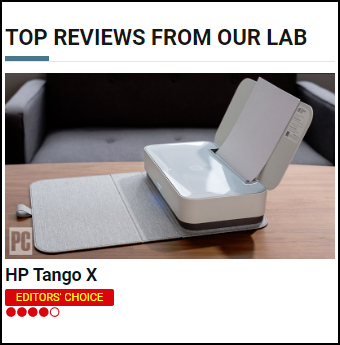 All these things and more elevate the HP Tango X to our first Editors’ Choice in a budding category: the smart, or smart home, printer.